Every business nowadays needs a way to generate a lot of reports. There are various software applications that try to fill this gap. Some are very powerful tools, but not as easy to learn and use. Every tool has its benefits and its drawbacks. Trying to create an application for report generation which is also simple to learn as it is to use was the first thing taken into account when NextReports began its journey. It is an Ad Hoc Query and Reporting tool. Its current version 2.0 was redesigned to allow for a better report layout and functionalities. NextReports can connect to popular databases like oracle, mysql, microsoft sql server, derby. 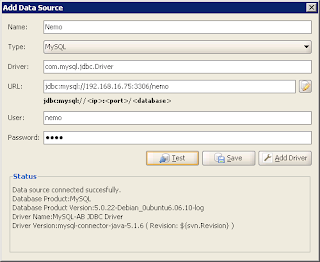 But it also can be extended to connect to any database for which there is a jdbc driver. Reports created with NextReports can be exported in html, excel, pdf, csv and tsv. NextReports is written in java and it can be used on any platform which supports at least java 1.5.Also a zip archive is provided for other operating systems. There are installers with or without the jre, so you do not have to worry if you have java installed or not. Just use an installer with jre and you're ready to start. It has only a few jars dependencies and so the installer has a small size (an installer without jre has about 6MB). NextReports has a very easy learning curve. For that , an embedded data base was added to the application, and a demo report can be used to understand the main functionalities. A manual and some basic tutorials will guide you through all the aspects. With NextReports creating reports can be a simple process. Even if you have no knowledge of what sql means, you can do your reports using a designer, only with drag and drop and mouse clicks. 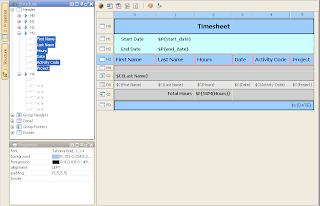 The layout has a grid structure and in contrast with an xy Layout (at pixel level) for other tools, the user can work with it as easy as in excel. Practically, a full process consists of three steps. The first step is to create a data source. For this you have to know the parameters needed for database connection. (Figure.1) But if someone already did that, he can export the sources to a file and send it to you. With a simple import you can now use all the data sources. After you connect to a data source, you will be able to see all the tables , views, queries and reports. You can also select what schemas you are interested in. Using a designer, you can drag and drop what tables you want, select the columns, create expressions. (Figure 2.) In this way a user creates a query which can be saved and used in the process of report creation. You can define parameters and use them in some criterias. A parameter can have a type (string, data, integer ,...) and a selection type (single, multiple). Depending on these, at runtime the user will see for parameter selection a combobox, a list , a calendar , a text field. A parameter can take its values from a database column, from the result of an sql select execution, or can be simply entered by user at runtime. A parameter can depend on other parameters and that will bring benefit in loading fewer values at runtime. 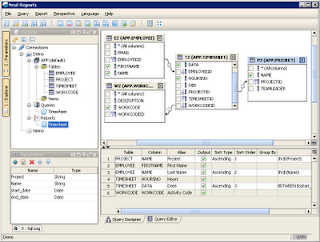 Starting from a query, the user creates a report and can modify its layout. (Figure.3) The layout is a grid structure, and every cell can be editted through its properties like font, background color, foreground color, allignment, padding, border, data pattern . Report layout allows user to add rows,columns, to create groups, to insert database columns, parameters, variables, functions, text.With the wizard, the report can be automatically formatted using templates. So, NextReports will allow you to create reports in an enjoyable manner and in short time. Feel free to try it and see for yourself.